"Chicken without sexual life" has been transformed into "Steamed pullet"
BEIJING, China (CNN) -- What's in a name? Westerners are more accustomed to names that describe the ingredients and how they are cooked. 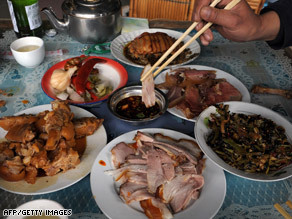 Local dishes like "Husband and wife's lung slice" or "Chicken without sexual life" conjure lots of furrowed eyebrows on famished foreigners. So, with the Olympics a few short weeks away, China is giving its cuisine a linguistic makeover. It is proposing that restaurants change the names of exotic, but bizarrely named, delicacies to make them more delectable for the estimated 50,000 visitors arriving in August for the Summer Games. The appetizer "Husband and wife's lung slice" is taking on the more appetizing "Beef and ox tripe in chili sauce." "Chicken without sexual life" has been transformed into "Steamed pullet." The government has put down more than 2,000 proposed names in a 170-page book that it has offered to Beijing hotels, according to state media. "Thanks to the pamphlet, we do not have to struggle to come up with the English translations of dishes any more, which is usually time consuming," a senior manager at the four-star Guangzhou Hotel in downtown Beijing told the Xinhua news agency. The Chinese say the names of their dishes focus more on appearance than taste or smell. But Westerners are more accustomed to names that describe the ingredients and how they are cooked -- such as pot roast. The government realizes local names are a matter of taste, but don't want them to get lost in translation. Hence, the spicy Sichuanese dish "Bean curd made by a pock-marked woman" has been bestowed the more palatable "Mapo tofu." "The process of standardizing a menu translation is a double-edged sword," wrote columnist Raymond Zhou in the China Daily newspaper. It "removes the ambiguity and unintended humor" and "takes away the fun and the rich connotation. "It turns a menu into the equivalent of plain rice, which has the necessary nutrients but is devoid of flavor."